Who doesn’t want an excuse to drink butter? Heat milk and eggnog until warm, but don’t allow to boil. Add vermouth and stir to incorporate. Grate cinnamon and nutmeg over mixture and divide between two mugs. Put a half teaspoon of butter in each mug. This entry was posted in Recipes, Spirits and tagged cocktails, holidays, hot drinks, liquor. Bookmark the permalink. I will drink butter any darn day of the week LOL.. This makes me happy. When I lived in France, I began to put butter in hot chocolate on a whim. Spectacular. I say YES to drinking butter! Yes, the phrase drinking butter is delicious wording. Going back to the gym in January! 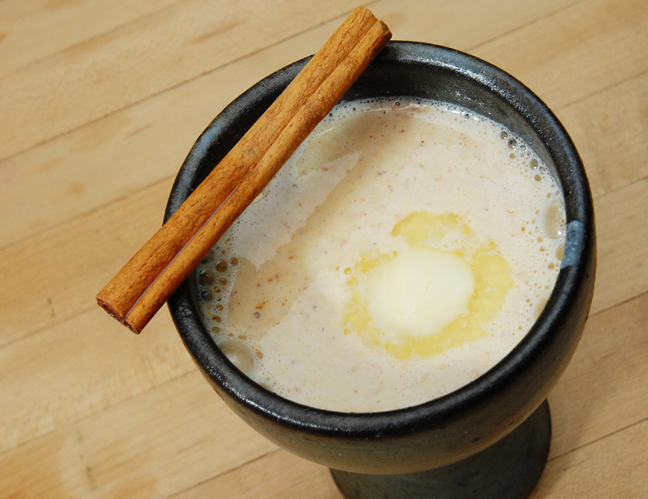 In the near future, i am seeing a taste test in my house: Hot buttered nog versus hot buttered rum! I am so far in favor of your butter-drinking proposal that I would consider it a perfectly appropriate recipe for Hot Buttered Rum if it included only the titular ingredients. This Nog, however, one-ups the concept I’m pretty sure! decadence in a cup ! I am a big fan of butter but I’ve never put it in a drink. I guess it’s only a teaspoon! Must give it a try. Fantastic – have never heard of it before, but it looks amazing! Looks like butter tea from Bhutan! Greg, you want to destroy my liver already tired by Christmas and post-Christmas drinks? This looks delicious and very exotic for someone who has never had an eggnog. Holy cow! Hot buttered nog sounds so decadent. Do you use sweet or salted butter? Hey, Eva. I use unsalted. A boozy melted stick of butter! Mmmmmmmmmm. Jeez, Greg, It isn’t even 9:00 am and you’ve got me salivating over a cocktail! I’m not a huge fan of egg nog but this looks like something I’d sip on… I guess it’s just the carton of eggnog at the grocery that scares me 😉 Cheers! That sounds good–I really like eggnog, and have to have it every holiday season! Oh my! I’ll take mine with a smidge of rum, too, please… mmmmmmmmmm!! A very Paula Deen-worthy drink! It’s not even cold here in NZ and I fancy a cup of that. You two make the most interesting cocktails!! I just can’t keep up on my testing of all your recipes!! That swirl of butter puts the taste of this drink over the top good! Haha…ya I’ll drink some butter. Fire it up bartender! A three-Lactaid drink for me. I must have this and very soon! Watch out, Paula Deen….that looks positively, wickedly, good! Paula Deen, is that you!? We object! Paula would have the entire stick half floating in there, half a teaspoon is quite restrained of us. Mmmm, a whole stick of butter. Ha – this made me laugh. It looks quite tempting. Oh my goodness. Just what eggnog needs – butter!! Good grief! I guess no one ever said that eggnog was a diet drink. This looks so good. I absolutely love eggnog. Scary — did Homer Simpson sneak into your house? No, I guess not — he would have made it with beer. Happy New Year!